Maneuverability is the hallmark of the Pronto P31. A very tight turning radius of 27”. A maximum speed of 4 mph and a travel range of 12+ miles on a charge. It weighs 151 lbs. – though it can be broken down into two parts for travel, both are heavy. It may be necessary to add a lift or rack ramp if traveling a lot with the chair. Though not meant as a travel chair it’s a very good powerchair at a decent price. 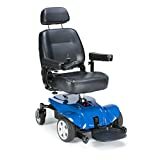 Here’s a wheelchair that’s easy to navigate, yet powerful with a weight capacity of 300 lbs, a good driving range that runs smoothly on most surfaces while at the same time very affordable. These are the reasons why I’d recommend the Invacare Pronto P31 Power Wheelchair. This front-wheel drive power wheelchair is designed mainly for use in and around the home but can be used locally, though preferably on smooth surfaces. 1. Maneuverability is the hallmark of the Pronto P31 thanks to a turning radius of 27” and a ground clearance of 1.75”. There may be other models in the market with a better turning radius and ground clearance but if you have a limited budget, then the Invacare Pronto P31 Power Wheelchair should be more than enough to satisfy your mobility needs. 2. It runs at a maximum speed of 3+ mph and has a travel range of 12+ miles on a charge – which is pretty good. 3. The two 12V 34 Ah (UI??????) batteries need 8-10 hours charging time and with frequent charging they will need to be replaced about every eighteen months. 4. Adjustable, flip-up removable full length armrests and an adjustable-angle footplate that can also be folded back, making it easier to stand when getting in and out of the chair. 5. The seat’s dimensions (18” x 18”) ensure comfort, and it can both be adjusted for height and can be rotated through 360° (it locks in place at each 45° rotation) for easy transfers. The seat back can be adjusted to the desired angle by lifting up on the release handle on the side of the chair. 6. The Invacare Pronto P31 Power Wheelchair has flat-free 9” drive wheels and 6” rear caster wheels, which make the drive ultra-smooth. 7. The joystick can be mounted on either of the arms as per the user’s preference. There is a five-year (limited) warranty on the base frame, three-year (limited) warranty on the seat frame, 13 months on the motors and electronics and six months on the batteries. One thing that I find a little troublesome about this chair is the 8-10 hour battery charging time – normally batteries will charge in about half that time! The overall weight of the wheelchair is 151 lbs. (with the batteries installed) which makes traveling with it difficult, both because of its size and weight. Though it can be broken down into two parts for travel, both are heavy. 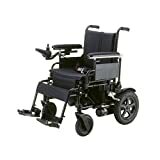 And, since this chair does not break-down easily it may be necessary to add a lift or rack ramp (such as the Best Choice Products SKY1700 Mobility Wheelchair Carrier) to your car or SUV if you intend moving it from place to place with any regularity. So, for me, it’s a very good model at a decent price. Though not meant as a travel chair it works well for day-to-day chores and moving around your home, office or your local surroundings, especially if your home is accessible and stairs are not an issue. Plus the price is right!